GERMANY: The tensile capacity of suction bucket foundations increases temporarily during extreme weather conditions, according to new research. Particularly strong waves striking turbines’ foundations during storms create negative pressure and significantly increase the buckets’ load-bearing capacity, researchers from Fraunhofer’s Institute for Wind Energy Systems (IWES) found. IWES project manager Tulio Quiroz said that the suction buckets’ ability to resist being ‘pulled out’ or broken increases temporarily "by a percentage in the two-digit range during a typical storm". This increase could be "even higher" during more extreme storms, he added. Quiroz said: "The suction bucket foundation displays a great deal of potential for an even more reliable and cost-effective deployment in the North Sea. However, the installation requires considerable expertise and validated prediction models." Suction bucket installation is fast and avoids the pile-driving noise associated with traditional offshore wind farm foundations, meaning it could be used at sites subject to noise restrictions, Fraunhofer IWES stated. It is also reversible and can be carried out without using heavy equipment, the researchers added. Installation is carried out by pumping water out of sealed containers (‘buckets’) to build up negative pressure, which draws the structure into the seabed. Fraunhofer IWES had carried out tests on a suction foundation, which featured a 1.4-metre wide bucket at its base, at Leibniz Uniersität Hannover’s Test Centre for Support Structures in northern Germany. In real-life applications, the same components can reach diameters of between six and 15 metres. In March, Vattenfall installed suction bucket jacket foundations at its 11-turbine European offshore Wind Deployment Centre (EOWDC) off the east coast of Scotland. The technology has also been used for the substation at the 402MW Dudgeon project off the east coast of England, and in prototype form for one turbine at Ørsted’s Borkum Riffgrund project in the German North Sea. 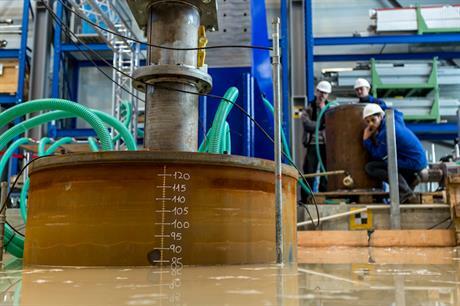 Fraunhofer IWES’ tests were carried in the test centre’s 14-metre long, nine-metre wide and ten-metre deep foundations test pit, which was filled with sandy sediment to recreate the conditions of the North Sea.